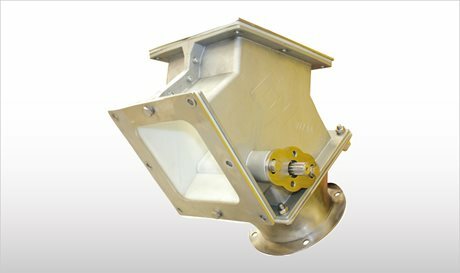 DVA Diverter Flap Valves ensure efficient flow diversion for powdery or granular materials in a variety of industrial processes. DVA-type Diverter Flap Valves consist of a casing made up of two high-pressure die-cast semi-bodies manufactured from aluminium alloy, lined with SINT engineering polymer, and a SINT engineering polymer flap. The flap is either activated by a manual lever, a pneumatic or an electric actuator. DVA is a Diverter Flap Valve with one inlet and two outlets for the diversion of the flow of powdery or granular materials. Materials used enable quick cleaning and maintenance apart from offering great resistance to abrasion.